Our absolutely charming Sofia the First wall stickers will certainly delight your own little princess. Sofia, Flora, Fauna, and Merryweather will make your girl's bedroom a beautiful place to be. Pair our giant Sofia wall sticker with the smaller coordinating decals to create an elegant and magical theme in any little one's bedroom or playroom. 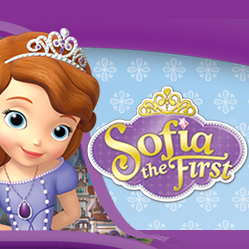 Like all RoomMates wall decals, our Sofia the First stickers are removable and repositionable. They can be applied, removed, and repositioned countless times without damaging your walls or peeling away any paint. So when your little girl needs to move to a new room, you can take her stickers with you! Just peel them away, place them back on their liners, and move them to a new spot. It's as easy as that to keep the Disney magic with you at all times!